HAM founder and medical director Tracee Laing, and her husband and HAM’s Director of Operations Paul Hammond, led a team for our final trip of the year to Haiti, October 22 to 29, 2017. Joining Tracee and Paul we’re long time HAM volunteer and board member, Dr. Leslie Mihalov, veteran eye clinic volunteer Susan Palleschi, first time Haiti volunteer nurse Pat Martin, and HAM’s newest board member, Jack Blanks. Jack returned to Haiti after a 15+ year absence, though this was his first visit to HAM projects. The team jumped right into it Monday morning with Susan and Charles seeing eye patients, Drs. Leslie and Tracee seeing patients, and nurse Pat bouncing back and forth providing medical assistance. The medical team spent the afternoon doing home visits in the Dumay community while Paul and Jack spent the day in Port-au-Prince resourcing. 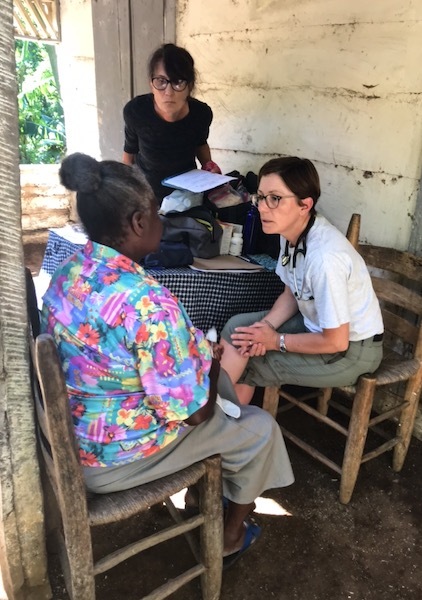 Tuesday began our annual medical visit to the Demier community located in the mountains on southwest peninsula of Haiti. 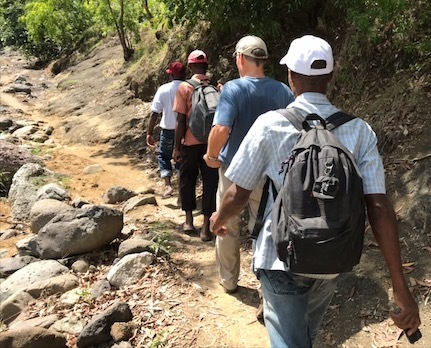 Demier community leader, HAM health worker and water technician Ferdinand led our team of Dr. Tracee , Susan, Jack, Charles HAM’s eye technician and interpreter, and Jony another long-time interpreter, on a long hike into the mountains to his home, where the team fed and housed. It is an eight hour journey from the Dumay clinic to Ferdinand’s house and as there is no electricity in Demier the long travel day quickly concluded with a lovely dinner prepared by Mdm Ferdinand. Clinic began early the next morning with some patients arriving before the sun. Jack assisted Ferdinand hanging a tarp to provide some shade for the waiting patients. 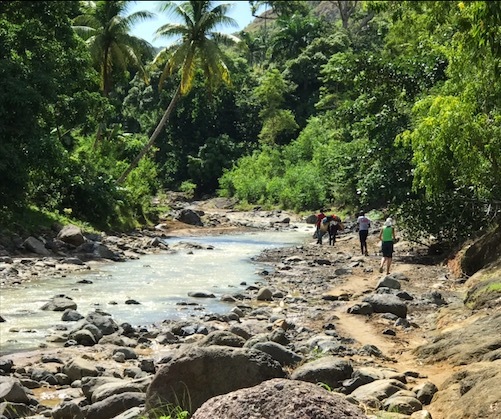 Dr. Tracee spent the day examining over 40 patients, ranging in age from babies to octogenarians, including a followup visit from a young woman hit in the head with a rock and knocked unconscious who they encountered on the hike to Demier the previous day. This was the first time we held an eye clinic in Demier where Charles and Susan, assisted by Jack saw over 40 eye patients for glaucoma, cataracts and general vision checks. 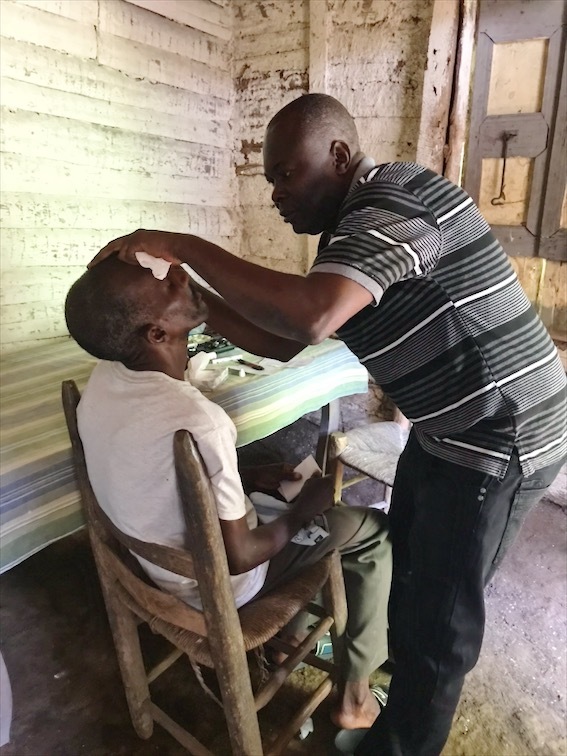 The team brought a variety of prescription glasses and could offer drops for minor issues, but equally important was the assessment experience providing HAM with a better understanding of how meet the eye care needs of the Demier community. The end of the week proved extremely busy with the entire team back in Dumay. The eye clinic was in full swing, Drs. Jacques and Leslie performed several surgeries, and Dr. Tracee and Pat saw many patients. 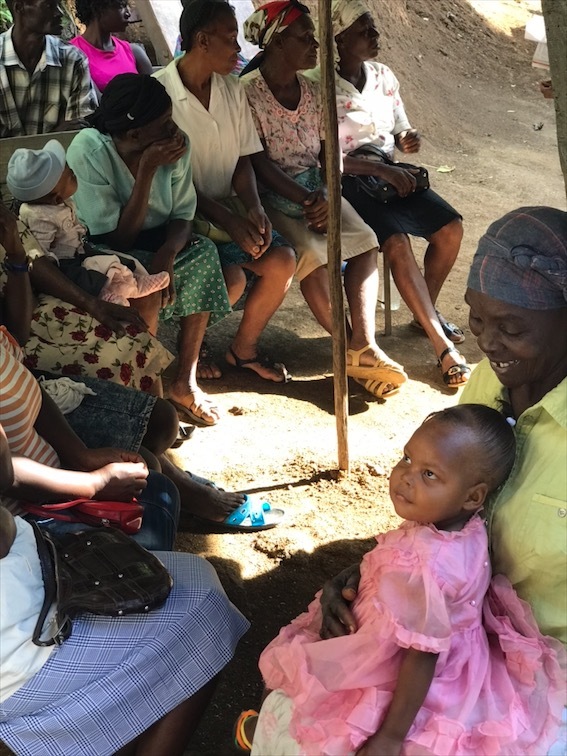 Friday proved so busy that Dr. Verdieu, HAM’s doctor on Tuesdays and Thursdays, who brought her daughter into the clinic for some lab tests saw how backed up patients were and immediately pitched in and began seeing patients while her daughter sat on her lap. It was a very productive trip that also allowed for critical planning time with Dr. Jacques. 2018 will see the start of HAM’s new birthing program as our two nurses who’ve spent the past year training with Midwives for Haiti in Hench graduate in January and return to Dumay to work full time. Additionally we are making important improvements to the clinic’s surgery and surgical support areas, and we plan to begin contraction on a building addition providing improved patient flow, additional primary care exam rooms, and a new pharmacy.